Your whole group can ride a bike to Drysdale, have lunch, and return by train. Perhaps lunch at a winery or Suma Park. Alternatively, park the car at Drysdale, then use the Bellarine Rail Trail and cycle downhill to Queenscliff, enjoy the sights of this historic seaside town then catch the train back to Drysdale. Your cycle will be safely carried in the Guards Van. The Bellarine Rail Trail is one of the few cycling tracks in the world where you can cycle safely beside a steam train. Weddings and Receptions Birthday Parties Unique Dining Events End of Year and Xmas Parties Social Club events Spit Roasts, BBQ’s School Excursions Group Outings or as part of a coach tour. In addition we have can co-ordinate your unique event with other local attractions, including the historic Suma Park Homestead and Convention Centre, and local hotels, restaurants, and wineries. 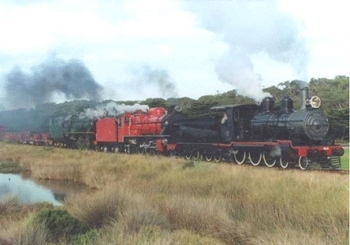 Bellarine Railway steam or diesel trains can be hired for any charter event. Whether you require a special passenger train, a dining car train a goods train or one you want to drive yourself. We can accomodate your needs. Our trains are often used in TV Shows, Films and Commercials, and we have experience working with motion picture production companies. To find out how we can help you with a train that provides your needs, please contact us.